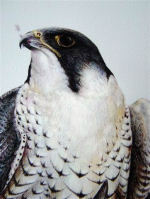 A Bird of Prey The Peregrine Now you can own a signed limited edition print, (only 50 printed), by a successful Wildlife Artist using an original medium. At an affordable price! Image shows Another of Nick's Bird Of Prey "Peregrine Head and shoulders",in an acid free mount.Size of the print is 12" by 15"(38cm by 30.5cm)This is signed and numbered limited edition of 50 only.Printed to a very high resolution and standard, on superb quality paper with fast inks to guarantee total colour strength for at least 80 years under normal conditions. You will be very impressed with the price and the quality of this mounted print. Large powerful falcon. Blackish hood, slate upperparts and barred below. Juveniles brown above with streaked underparts. Distinctive anchor shape in flight. Female larger than male. Patchily distributed, breeding mainly in the north and west of the United Kingdom, but more widespread in winter. Coastal cliffs, mountains and moorland. Occasionally in cities. To A Buy "Peregrine Head and Shoulders"